A record crowd of over 70.000 have witnessed the Cliff Divers World Series event in the French city of La Rochelle. ­Death-defying dives from dizzying heights of over 27 meters, with almost three seconds of free fall before entering the water at a speed of almost 100 kilometers per hour. Cliff diving is one of the most dangerous sports on the planet as just a slight mistake may result in broken bones or much worse. And even top cliff divers confess they have to fight their nerves before every single high dive. “Yes, it's fear, but it's not panic. It's good when you're scared. It would be far more dangerous if we weren’t' scared. And before any high dive I realize how risky it is. But you should be positive,” Artyom Silchenko, Russia's top cliff diver, said. And Silchenko’s rival and 2010 World Series winner, Gary Hunt, echoed his words. ”Yes it is scary and thrilling, but that is part of the enjoyment. There's a danger factor, but we train for many, many years to become divers of a professional high quality and so the risk is minimized,” he said. The latest stage of the 2011 World Series took place in La Rochelle, a place where the breathtaking height and weather conditions come together to challenge elite cliff divers. 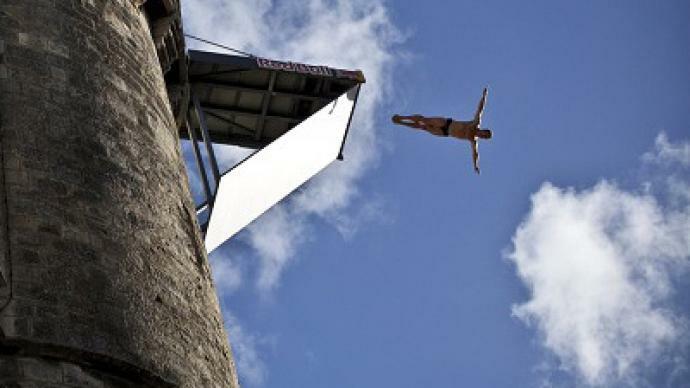 The time for high diving comes within just a few hours of the high tide, while a stiff Atlantic breeze of up to 80 km per hour makes the Saint-Nikolas Tower platform one of the toughest spots the World Cliff Diving series has to offer. But all that pressure and risks these dare devils take pay off as the reward they get in the end is, to them, priceless. “You swim to the surface and take a deep breath, and it is such a big relief! You've built up so much emotion before the dive…and when you finally hit the water and everything's ok you're so relieved. It's an indescribable feeling. I have not felt this feeling in any other sport,” Hunt said. “The feeling you get doing high dives can hardly be compared to anything. It's a competition. It gives you an amazing drive. Especially when all the best cliff divers come together and you manage to beat them all,” Silchenko explained. It is eye-catching. It is extreme and it has been competitive since the year 2000, and each passing season it takes yet more skill and complicated high dives to win. “We want a perfect take-off, we want perfect precision in the air, and perfect bottom just because an athlete brings in some new elements – that doesn't mean a judge would give him more points. We first want perfection, we're looking for perfection and we judge according to how they dive,” Ken Grove, cliff diving adjudicator, said. The biggest ever crowd of 70,000 spectators, witnessed 12 men demonstrate their stunning abilities at the latest leg of the World Cliff Diving Series in La Rochelle. 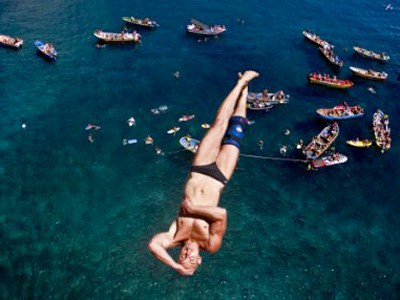 “Cliff diving is an up-and-coming sport. There are a lot of different locations all over the globe which can host high diving competitions. I'm a classic platform diver, and my sport never attracted as many spectators as cliff diving. Never,” Elena Vaitsekhovskaya, 1976 Olympic diving champion, said. The French leg came to an end, but the thrills and spills continue in Italy next month.